If there's one thing people should know about me, it's that I like my sleep. Wake me up whilst I'm snoozing and you may instantly regret it. Besides loving the odd nap here and there, getting the right amount and quality sleep is actually extremely beneficial to our well-being. Over the last few years, I have suffered from insomnia as a side effect of anxiety so when Holland & Barrett contacted me asking me to get involved with their Sleeping Beauty campaign, there was no hesitation. I need all the help with sleep I can get. Having a good sleeping pattern aids our mental and physical health, two things that need to be well looked after. Since regulating my sleeping pattern and getting approximately 8 hours a night, I have noticed a drastic difference in how I act as a person. Once I've had a good night's sleep, I wake up in a much more positive mindset which of course, is never a bad thing. Holland & Barrett very kindly sent me a bunch of goodies to help me unwind and relax before heading off to sleep which I have been using over the last week or so and let me tell you, they are pretty damn good. First up, I'm going to be talking about the bathtime products I was sent which side note, I love them all. 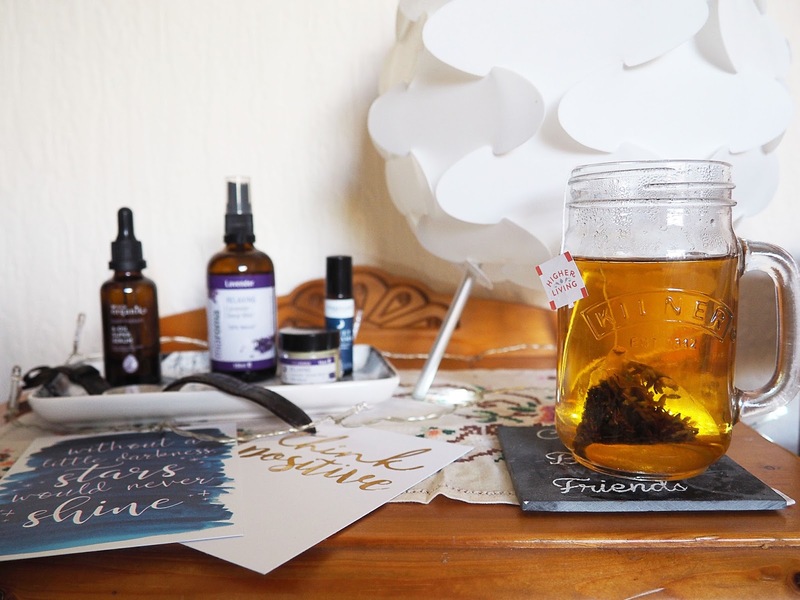 I thought I'd jazz up this post a little and talk you through the products as I use them in my night time routine, sound good? Let's go! 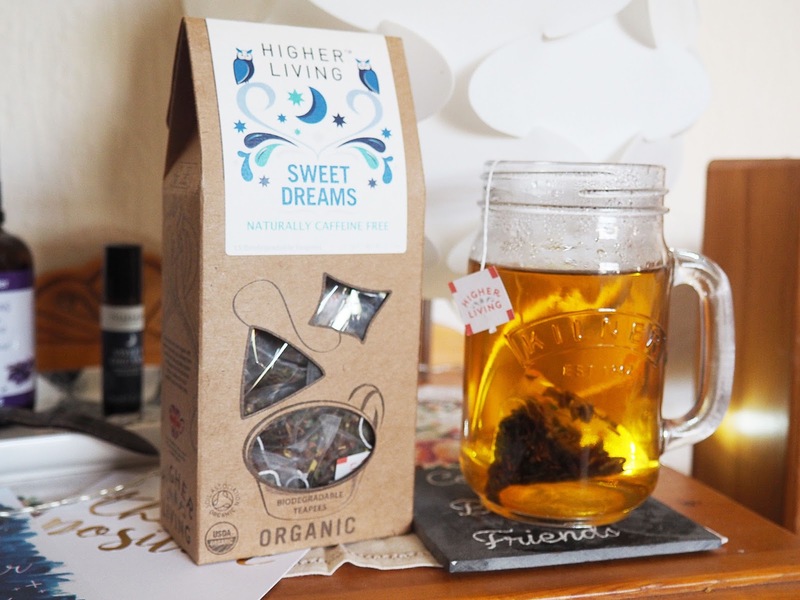 When it comes to falling asleep, I struggle with detoxing and relaxing before bed. My mind is constantly whizzing which usually results in me watching Youtube video after Youtube video and aimlessly scrolling Twitter for 5 hours, no exaggeration. Now I find that having a long soak in the bath, grabbing a herbal tea and sitting in bed watching Grey's Anatomy makes me sleepy very quickly, success. 8pm - For my bedtime bath I quickly replaced a few of my heavily scented Lush bath bombs with the Deep Sleep Lavender Bath Salts which were included in the Spa Magik Organiks Sleep & Moisture Therapy pack. 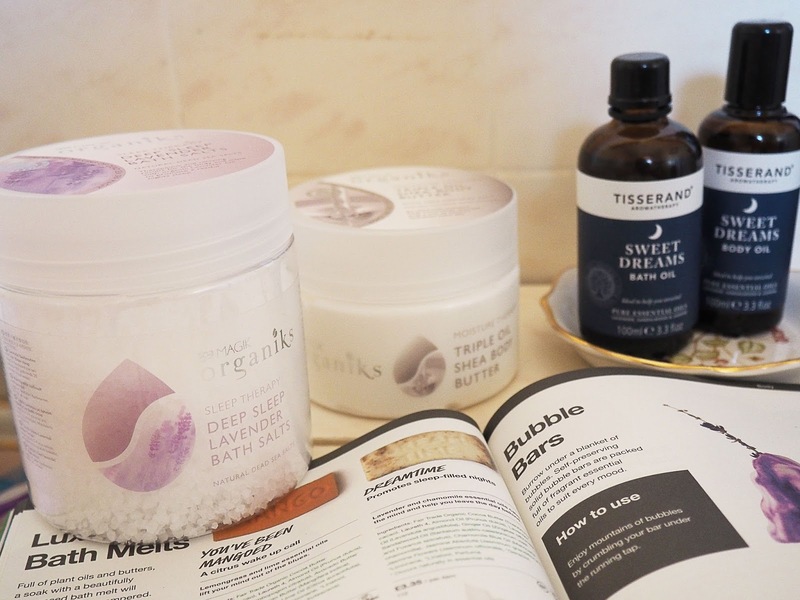 I pair the bath salts with the Tisserand Sweet Dreams Bath Oil and I am in for the cosiest bath ever. The bath salts and oil combined smells heavenly. I'm not one for floral scents but there's something about this particular Lavender scent that I am obsessed with. 10pm - Once out of the bath... Mhm, I have two hour long baths - Twitter is distracting ok, I love to put on a really rich moisturiser. Girl gotta look after that prune-like post bath skin you know. The Triple Oil Shea Body Butter (also part of the Spa Magik Organiks pack) is perfect for moisturising after a bath or shower. It smells like holiday to me and as it includes avocado, coconut and sweet almond, you can probably imagine how moisturising it is. 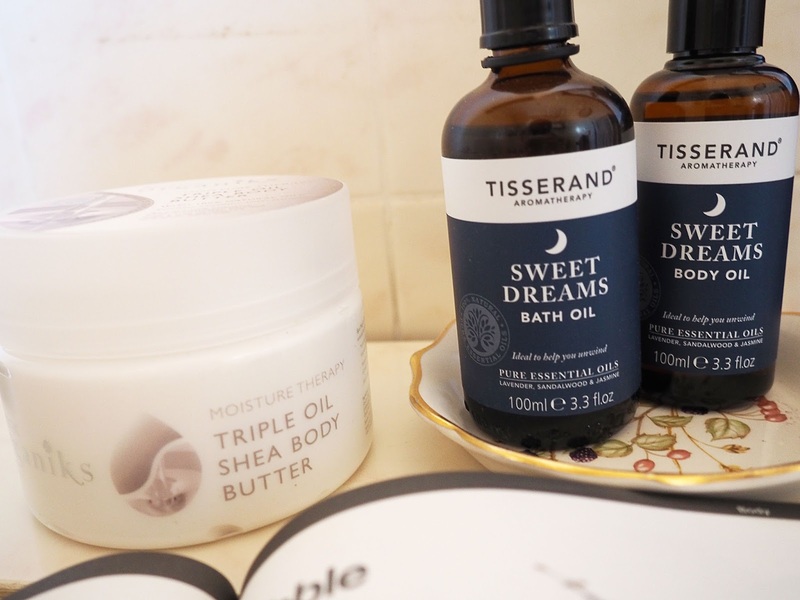 I love to alternate between moisturisers, so I have also been using the Tisserand Sweet Dreams Body Oil which is probably one of my favourites out of what I was sent. You're probably thinking, "Yikes, oil before sleep? Won't you make your bed all greasy?" which is a fair assumption. I thought that too initially, but no. This oil isn't greasy at all and soaks into the skin pretty much straight away leaving your skin lovely and soft, or soft as a baby's bum as my mum would say. 10.15pm - I like to settle down in bed and binge Grey's Anatomy for a few hours but before that, it's time for tea, the drinking kind obvs. H&B sent me two teas over but my favourite out of the two is definitely the Higher Living Sweet Dreams tea. It smells exactly like Christmas to me and surprisingly tastes delicious too... I'm very fussy with herbal teas. The other tea I was sent is the Dr Stuart's Valerian Plus which don't get me wrong, is lovely too. I just prefer the other one. 11:45pm - Time to moisturise my face. Honestly, I'm pretty bad when it comes to doing a skincare routine before bed. I'm usually just so sleepy, I don't want to faff around with 10 different products, but who does really? That's why I've been thoroughly enjoying using the 6-Oil Super Serum which again, is the final component to the Sleep & Moisture Therapy pack. Similar to the Tisserand Body Oil, it has that amazing Lavender scent that has captured my heart nose and isn't greasy in the slightest. 12am - I hit the hay pretty late, I know, feel free to yell at me. I promise you my bedtime is much earlier than it used to be. As I climb into bed after my marathon of Grey's, I absolutely cannot go to sleep without spritzing a bit of the Miaroma Lavender Sleep Mist onto my pillow. It's safe to say I have a new found love for this product. I don't know how it works or how it manages to send me off to sleep so quickly and calmly, but it does! I'd definitely compare the sleep mist to the This Works Pillow Spray, only much more affordable. If I'm feeling particularly restless one night, I use the Tisserand Sweet Dreams Aromatherapy Roller Ball and use it on my pulse points as the bottle explains, yet another lovely product and a concept I hadn't heard of before now. I would also like to point out that if you are a frequent migraine sufferer like me, the Miaroma Relaxing Lavender Temple Balm works wonders. 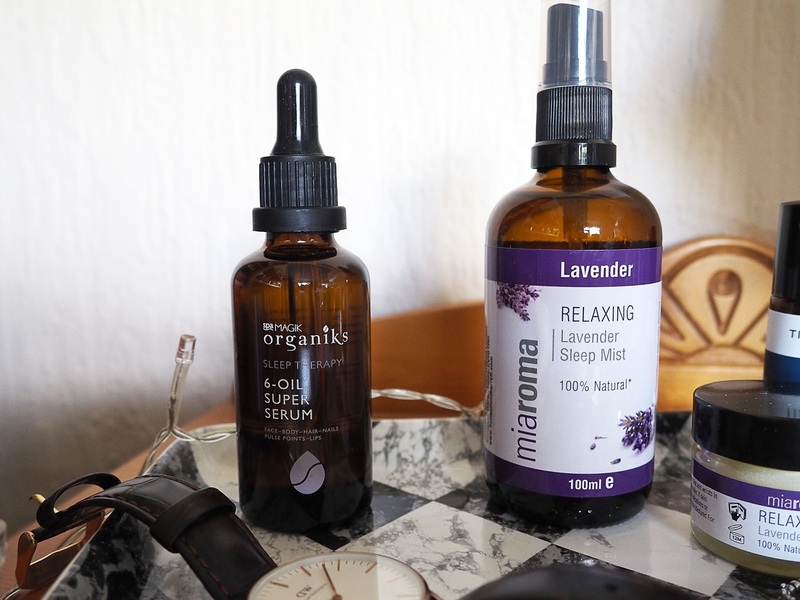 My migraines tend to occur a couple of hours before bed and although the balm doesn't shift them completely (obviously because it isn't a medicine), it eases them slightly and makes them just that little bit less painful - it's worth a try! And there is my new and improved night time routine! No more midnight snacks of beans on toast and definitely no more staying on my laptop until some unruly hour. 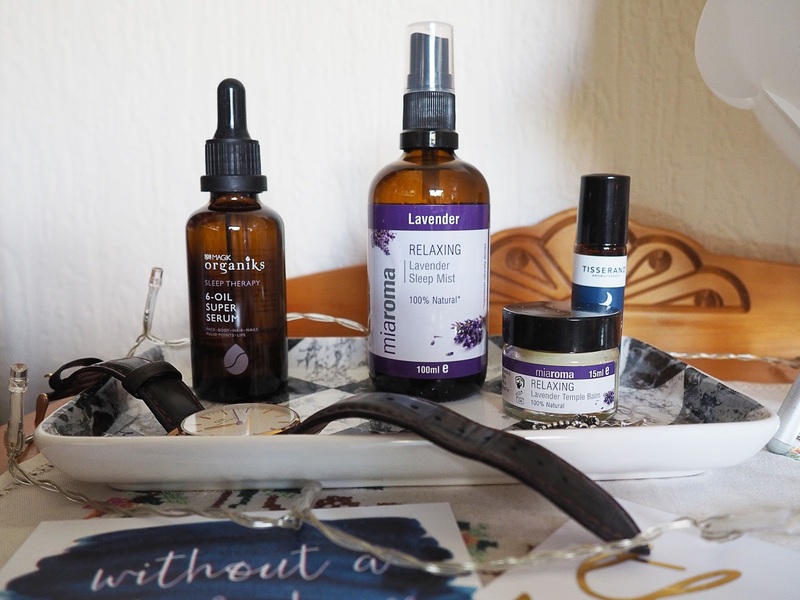 I have loved working with Holland & Barrett on their Sleeping Beauty campaign and even discovering new products for myself, there are definitely some things that I'll be re-purchasing in the future, cough, the pillow spray. Feel free to check out the products and let me know what you think! Do you have any tips or products that help you to relax before bed? These products sound great! Having a bath right before bed always makes me feel super cozy and I have a great nights sleep! This sounds perfect - I've been looking into pillow sprays for a while I definitely need to pick one up! Loveeeee this post, well I love anything anything to do with sleep. I really hate the smell of lavender, but oh I need to try something like this! Getting a good night time routine is definitely where I'm failing right now.